Apart from inhabitants of the northern sector of the Volta Region, the rest of the region may not be allowed to partake in the referendum that would lead to the creation of a new region out of the existing region. This was disclosed by President Nana Akufo-Addo during a durbar held in his honor at Dambai for heeding to calls for the creation of a new region. The President explained that best practices across the world allow only those affected by the referendum to to take part in such polls. Making reference to a similar exercise in 1956 that led to Transvolta Togo land joining Ghana, the President recounted that only those in that area were allowed to partake in the voting. About eight (8) districts including, Nkwanta South and North, Krachi Nuchumuru, Krachie East and West, Biakoye and Jasikan, have for more than half a century been petitioning successive governments for a new region. Although various reasons of underdevelopment and inaccessibility of the current regional capital were given, their southern counterparts do not seem to be in agreement and have equally been counterattacking the call. The chiefs at the gathering were outwardly excited and expressed their gratitude to Nana Addo for triggering the constitutional instruments that led to steps towards the creation of the proposed Oti Region. Per the Constitutional requirement, 50 percent of the people must come out to vote and 80 percent must approve the request. The Paramount Chief who represented the Oti enclave, Krachi Wura Nana Mprah Besemuna, assured the Present of a hundred percent turnout in the referendum. improve the governance of our people,” he added. 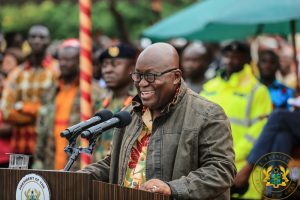 The president has advised inhabitants of the Volta Region to desist from acts that could create tension in the area following the decision to create the Oti Region out of the existing Volta Region. He said the inhabitants should hail the decision because it will rather bring more development to the two regions. “Please, we should not see it in an antagonistic way. It is not meant to be a prescription for making hostilities between one group of people and another lot of people. Volta Region is been noted for cohabitation amongst all kinds of people for a very long time. The creation of the Region is not intended to disturb it. In my view, God willing, it will, in fact, heighten the cooperation, the collaboration and the friendship between all the people in the Volta Region,” he added. The Commission of Enquiry tasked to analyze petitions for the creation of additional regions submitted its report to the President in June 2018. It recommended the creation of the Western North, Bono East, Ahafo, Savannah, North East, and Oti regions from the Western, Brong Ahafo, Volta and Northern Regions. Some critics, including members of the opposition NDC, have said it is an unnecessary project that will not lead to the desired development. The post New regions: Only affected areas will vote in referendum – Nana Addo appeared first on Citi Newsroom.